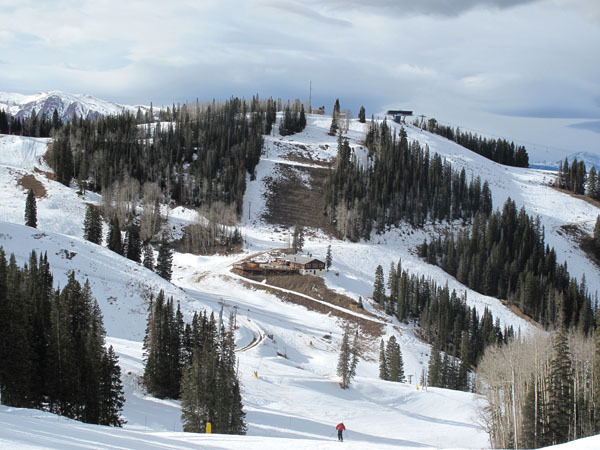 Expanding snowmaking not top priority for Aspen Skiing Co.
ASPEN – Aspen Skiing Co. officials have pondered expanding the company’s snowmaking system to the top of Aspen Mountain, but the project has never been deemed a top priority and isn’t currently being pursued. This season’s slow start won’t necessarily alter that view, said Rich Burkley, Skico vice president of mountain operations. The company hasn’t offered top-to-bottom skiing on Aspen Mountain so far this season because of a lack of snow on the upper slopes. Burkley said at least 8 inches of additional snow are necessary to open the upper mountain. Skico’s philosophy has been to rely on Mother Nature for ample early-season snow. That usually pays off. This year, Burkley said, is being viewed as an anomaly. The snowpack in the mountains around Aspen is about 37 percent of average, according to the Natural Resources Conservation Service, the federal agency that measures snowpack. When natural snow is sparse, Skico faces challenges. Last season started in contrast to this season – with more snow and lower temperatures than average. In November 2011, Skico scrambled to get Aspen Mountain and Snowmass open early. Then, it dried up, and the season ended with about half the average amount of snow. No season is really “normal,” Burkley said. Each produces conditions that require Skico to react. At Aspen Mountain, the snowmaking system covers strategic areas on the lower slopes and extends above the NASTAR course to Summer Road. Skico has several planned phases to expand that system on the upper mountain but no specific timetable to implement the plan. The first phase would cover about 12 acres combined on the Silver Bell and upper Copper trails, according to Burkley. Later phases would expand snowmaking coverage to another 22.5 acres on the upper portion of the mountain, he said. It likely would take about 7 million gallons of water, when making snow in “medium” temperatures, to cover Silver Bell and Copper with 18 inches of snow, Burkley said. “It’s not a huge project,” he said. Pipes for a water and air system would have to be buried underground. A booster pump for the water system would be required. The entire project likely would cost a few million dollars, he said. However, he stressed that the project hasn’t been approved internally or by the governments that have jurisdiction, the U.S. Forest Service and Pitkin County. The expansion of the snowmaking system is part of the master plan for Aspen Mountain, but it has never been pursued. “This one has not made it to the list as a No. 1 priority,” Burkley said. Skico’s senior staff typically starts going over possible capital improvement projects in December of each year and comes up with priorities for the following summer. Its recommendations are given to the owners, the Crown family, for final assessment. Burkley said there is no guarantee the project will jump to the head of the list because of the low snowfall so far this season. “If we have five seasons like this in a row, that could change,” he said. That could happen, according to a report set for release Thursday on climate change’s potential effect on skiing and other snowsports in the U.S. The Natural Resources Defense Council and Protect Our Winters will release details on how climate change could have a “devastating economic impact” on winter tourism in Colorado. Auden Schendler, Skico vice president of sustainability, will take part in a news teleconference to discuss the new report. His message has been consistent: Climate change threatens the viability of ski resorts. If Skico ever pursues expanded snowmaking on Aspen Mountain, it likely would bundle the study of the project with the proposed Pandora’s chairlift and expanded terrain, Burkley said. Conducting the studies required by the National Environmental Policy Act is expensive, so Skico would want to perform studies on various projects at the same time, he said. Implementation of plans wouldn’t necessarily be at the same time.